Sonic World is a short 3D level, found in Sonic Jam which is set in a grassy plains environment similiar to Green Hill Zone. There are plenty of objects to interact with, such as springs, moving platforms and rings (100 total). 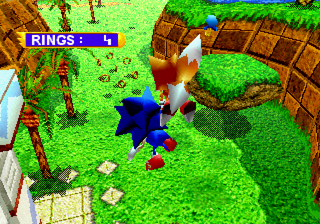 Gameplay in these levels is similar to Classic Sonic games as movemment is handled with the directional pad (or analogue stick) and the , , or buttons are used for jumping. No spin-dash is available. The camera view can be adjusted with , , and buttons. The camera can be rotated with the or buttons. There also cheat cards that can be found in the level which reveal cheats for each of the available games. According to a Retro Gamer Magazine article, Sonic World was a prototype Sonic Adventure, compiled based on what work had been done on the Sega Saturn version of the game. This was also revealed in the trivia section of the Sonic Advance 2 strategy guide. A museum which has two entrances. The "good" entrance, which has a Sonic statue by the door, contains information and sketches about Sonic, Tails, Knuckles, and friends. All four of these are selectable from a menu. The "bad" side, which a statue of Robotnik by the door, contains information and sketches about Robotnik and badniks from Sonic 1, Sonic 2, Sonic 3, and Sonic & Knuckles. The artwork of both the Character House, and the Art Gallery, can be found here. The Music Shop has music and sound effects from all the games contained on the CD, except for the music and sound effects of Sonic World. You Can Do Anything - the opening of Sonic CD with Japanese music. This and the next video are in higher quality than the Mega CD version. They are also extended (although a certain short scene is cut out). Believe in Yourself - the closing of Sonic CD with Japanese music. Sonic*The*Hedgehog - The japanese trailer for Sonic the Movie. Sonic the Animation - A short US animation about Sonic being named man of the year. Created with CG graphics. Sonic Ride - The video from a un-distributed kiddie ride. Commercials - Japanese commercials for Sonic 1, Sonic 2, Sonic 3, Sonic Spinball, Sonic CD, Sonic Triple Trouble, and Sonic Drift. Professionally drawn artwork of Sonic, Sonic & Tails, and Sonic & Friends. This museum contains a extensive history which contains Trivia and released dates of various Sonic games. Images used in the slideshow can be found here. No enemies are in the level, but there are 8 missions that can be completed. The missions are started by jumping on the red and white platform near the entrance. This is also where the player must go to complete a mission. If a mission isn't completed by the time the time limit reaches the existing time record the mission will end in failure and the player will need to start over. A failed mission is signified by a sound effect being played when the timer finishes counting. When the final mission is successfully completed, a giant Ring appears over the playing field. After jumping into it the credits will play and some rare artwork will appear in the background. Sonic World makes use of the VDP2 32-bit background and scroll plane video display processor for two tiled texture maps: the 3D ground plane and the 2D sky background. The 3D ground plane is 4096x4096 texels, while the 2D sky texture is 1024x1024 texels. Video showing all the missions being beaten on Youtube.